Below is the original image file from Shirley Cooper Castle. I tried to tidy it up a bit. David Brewer, son of David Nathaniel, with wife Eva and daughter Addie. Starting front left going right: Wilma, John’s mom (Delana Fowler), Monte, John, Eva holding John. Behind them from left to right: Daisie, Flora. Behind them left to right: Uncle Walter, Aunt Edith, Uncle Roy, Maude, Addie, Bill Smith holding Irene, (the group of 3 is of Albert, Ralph, and Lewis but Shirley isn’t sure which). Wilma Brewer was born 1907 and looks to be about 3 years of age here. 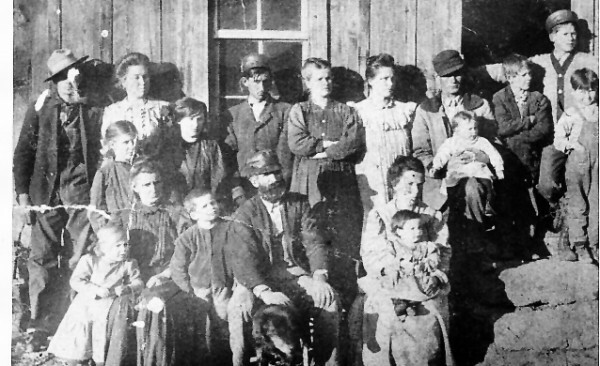 Delana Fowler Brewer, the matriarch of the clan here, was born in 1854. Monte Brewer was born in 1905. John David Brewer was born in 1869 and so is about 40 here. Eva Hall Brewer was born also about 1869. 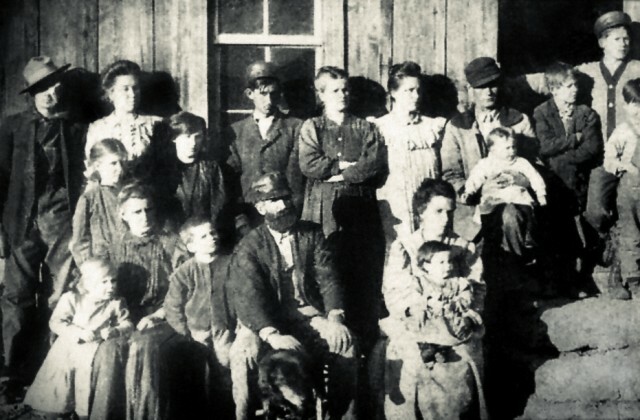 The child in her lap is John who was born 1909. 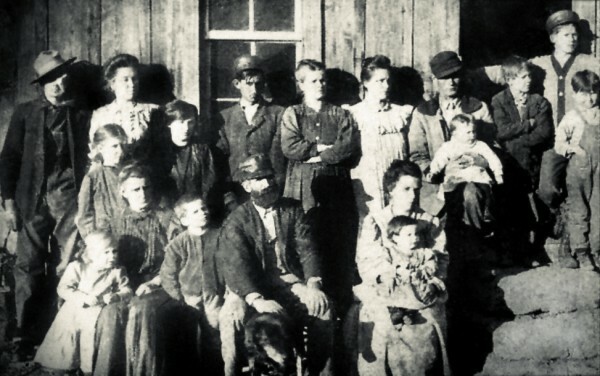 Daisie (Daisy), the girl standing to the left behind Delana, was born in 1898. Flora was born 1896. Walter Brewer, son of Delana and David Nathaniel Brewer, was born 1890. His wife, Edith, was born in 1894, so she would be about 16 here. Uncle Roy and Maude would be Clara Maudline (Maude) b. 1892 and her husband Roy Carrico. Addie Brewer was born in 1890. Bill Smith would be her husband and Irene their daughter. Ralph Brewer was born 1901 and would be 9 here. Albert Brewer was born 1894 and so would have been 16 in this photo and must be the taller boy, still short. Lewis Brewer was born 1903 and would be 7. 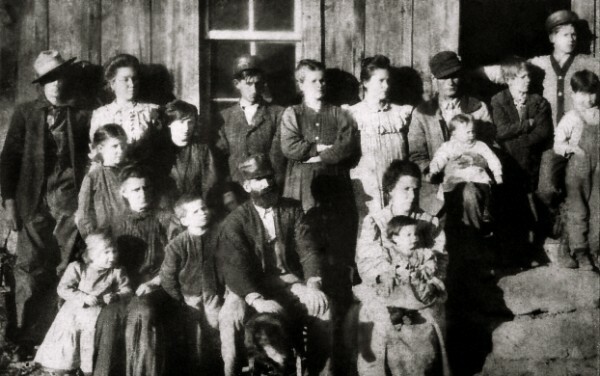 All the children of John David and Eva had to 1910 are thus all shown here. They would have two more after this picture: Elizabeth b. 1912 and Lellia b. 1915. John David Brewer, b. 1869 December 10 at Osage Mission, Neosho, KS, married Eva Hall about 1889. Year: 1930; Census Place: Galena, Jasper, Missouri; Roll: T626_1205; Page: 2B; Enumeration District: 22; Image: 0711. 1. Addie Florence b. 1890 Aug. in Barton county, Missouri, died 1977. 2. Clara Maudline (Maude) b. 1892 Jan, died 1945, married Roy Carrico. 3. Albert Lafayette b. 1894 Feb married Lena. They had three children: Elizabeth “Betty” Brewer abt. 1922, Ilene Brewer b. abt. 1927, and Sonny Brewer, b. after 1930 and died young. 4. Flora Mae b. Jan 1896, died, 1939. 5. Daisy Golden b. 1898 March, died abt. 1929, also married a Carrico. 6. Ralph b. abt 1901, died circa 1965. 7. Lewis David b. abt 1903, died about 1974. 8. Monte Monro was born about 1905. 9. Wilma Beatrice was born abt. 1907 and married Cecil Wycuff. 10. John Everette was born about 1909 and married a woman perhaps named Goldie. 11. Elizabeth Anna was born abt 1912 and married Edgar Haywood Cooper. 12. Lellia Violet Brewer was born abt. 1915, died abt 1994, and married Ira Wolfe. For information on the family of David Nathaniel Brewer and Delana Louise Jane Fowler Brewer click here.